Caylus is a medieval town situated between the limestone plateau of the ‘causse’ of Quercy and the rolling hills of the Rouergue, beside the Bonnette river. The architecture of the town reflects many historical periods the Albigesian crusade, the hundred years war and the religious wars notably the town square with its gothic arches and market hall and Rue Droite leading from it. 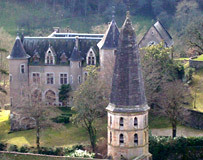 Dominating the town are the remains of the ancient Chateau Royal (14th Century) and the newer chateau (18thCentury). The centre DRAWinternational is just off the town square towards the Chateau. Between the Auvergne and the Pyrenees, Caylus and its surroundings offer many attractions - picturesque landscape, historic monuments, regional culinary specialties fois gras, confit de canard, cassoulet, goats cheese etc. (Caylus has a weekly market selling a variety of local produce). There is also great scope for walking, cycling and many more leisure activities. Just one hour from Toulouse and one hour from Rodez, Caylus is easy to reach by plane, car (A20 Caussade - D926 dir. Villefranche de Rouergue) and train (TGV Montauban - CORAIL Caussade).